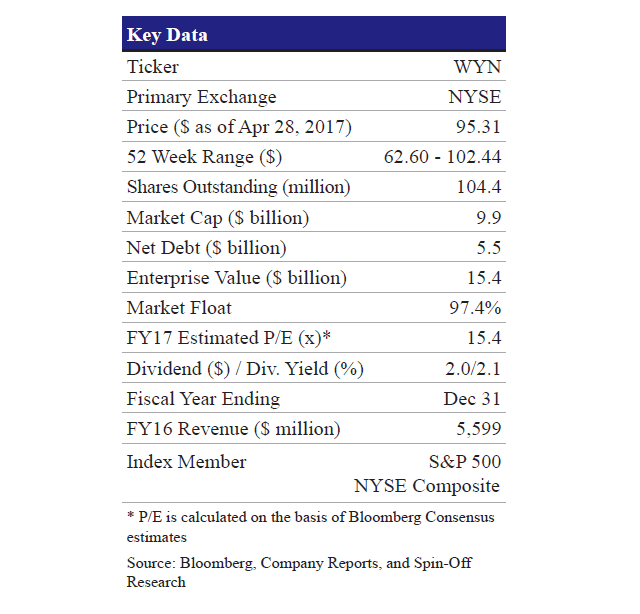 On April 26 2017, during 1Q17 earnings call, Wyndham Worldwide (NYSE: WYN, $95.31, Market Capitalization $9.9), CEO Steve Holmes discussed steps the company is taking toward a possible spin-off of its vacation ownership business, including the hiring of Mr. Mike Brown, a hotel industry veteran who was involved in a similar move by Hilton. Given the company’s relatively cheaper valuation versus the peers, the board of directors asked the company management to consider an option of separating the vacation ownership business. Mr. Brown was a COO of Hilton Grand Vacations while it was being spun off from Hilton and is expected to play a key role in the separation of Vacation Ownership Business at Wyndham. However, the company needs to have a clear strategy for its loyalty program (Wyndham Rewards) before the separation of the businesses. The loyalty program reportedly ties all three Wyndham’s business units together and it is a lot easier to implement the program as one company. The company reported revenues of $1,319 million in 1Q17 compared to $1,303 million in 1Q16, while EBITDA was $ 266 million in 1Q17 compared to $267 million in 1Q16. Net income for the quarter was $141 million compared with $96 million in the prior year quarter. Diluted EPS came in at $1.33 compared with $0.84 for the prior year period. Wyndham reiterated its 2017 EBITDA outlook range of $1.41-1.44 billion as well as its 2017 revenue guidance of $5.80 -$5.95 billion. Apart from the loyalty program, there reportedly is no overlap amongst the three segments and the company doesn’t derive any incremental benefit of the three segments being together. Since, Wyndham’s spin-off from Cendant in August 2006, all the three businesses have grown in size and can operate as an independent company. Given the apparent discount at which Wyndham trades versus the peers, the investor/analyst community has been asking to consider a separation to unlock shareholder value. With the successful recent spin-offs in lodging industry (Hilton Grand Vacations, Vistana), we believe now is the right time to separate the timeshare business. Moreover, the spin-off would create two separate businesses, enhancing the ability of each company to focus on their respective businesses and unique opportunities for long-term growth including tuck-in acquisitions. It will also allow investors to evaluate the separate investment identities of each company, including the distinct merits, performance and future prospects of their respective businesses. Incorporated on May 30, 2003, Wyndham Worldwide Corporation is a hospitality company. The Company offers a range of hospitality services and products through its global portfolio of brands. The Company operates through three segments: Wyndham Hotel Group, Wyndham Destination Network and Wyndham Vacation Ownership. In the Hotel group business, the company primarily franchises hotels and provides hotel management services for full-service and select limited-service hotels. The company’s Destination Network business provides vacation exchange services and products to owners of intervals of vacation ownership interests (“VOIs”) and manages and markets vacation rental properties primarily on behalf of independent owners while under Vacation Ownership business, Wyndham develops, markets and sells VOIs to individual consumers, provides consumer financing in connection with the sale of VOIs and provides property management services at resorts. 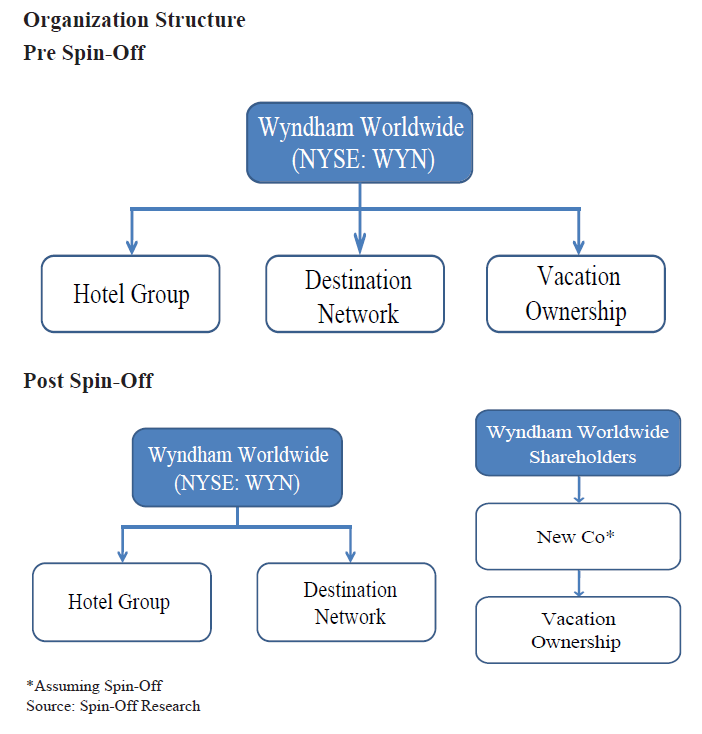 The Company’s Wyndham Vacation Ownership segment develops and acquires vacation ownership resorts; markets and sells vacation ownership interests (VOIs), provides consumer financing, and provides property management services to property owners’ associations. As of December 31, 2016, the Company had 219 vacation ownership resorts in the United States, Canada, Mexico, the Caribbean and the South Pacific. The company recorded revenues of $2,794 million (49% of total) and EBITDA of $694 million (48% of total) in Vacation Ownership business in FY16. DXC Technology, the corporate mash up between Computer Sciences Corporation (CSC) and HPE Enterprise Services closed its first official day of trading at $67.95 per share on April 4th on the NYSE. DXC Technology is a global technology company formed from the merger of Computer Sciences Corporation (CSC) and Hewlett Packard Enterprise's (HPE) Enterprise Services division in a “Reverse Morris Trust” spin-off. DXC Technology (NYSE: DXC-market cap $19.3 billion), the world’s leading independent end-to-end IT services company was added to the S&P 500 index. DXC is expected to generate $26 billion in annual revenue. The company will have 85 delivery centers and 95 data centers servicing over 5,000 clients speckled across 70 countries globally. Last May, HPE announced the spin-off of its Enterprise Services business, and its subsequent merger with CSC. The deal created a company with the requisite scale, expertise and leadership to catapult it amongst the world’s largest pure-play IT services companies. Shareholders of CSC received one share of DXC for each share of CSC. HPE shareholders received 0.086 shares of DXC for each share of HPE owned. HPE shareholders will retain a stake in HPE as well as a 50.1% interest in DXC. CSC shareholders hold the remaining 49.9% ownership. The spin-off and merger is tax-free to shareholders of both companies. We value DXC at $22.6 billion or $80 per share using a 9.7x FY17 EBITDA multiple. This suggests 18% upside from the first day closing price of $67.95 per share. 48% stake in combined entity while Clariant will hold the remaining 52% stake. Huntsman shareholders will receive 1.2196 shares in HuntsmanClariant for each HUN share and each existing Clariant share will remain outstanding as a share in HuntasmanClariant. The transaction is expected to close by year end 2017, subject to Clariant and Huntsman shareholder approvals, regulatory approvals and other customary closing conditions. HuntsmanClariant will have equal representation from Huntsman and Clariant. Hariolf Kottmann, current CEO of Clariant, will serve as a Chairman of the Board of HuntsmanClariant while Peter Huntsman, current President and CEO of Huntsman, will serve as the CEO. Patrick Jany, current CFO of Clariant will be the new CFO of the combined entity. Both CEO and CFO of the combined entity will be based in Corporate Headquarters at Pratteln, Switzerland while the operational headquarters will be located in The Woodlands, Texas. HuntsmanClarient is expected to have a dual listing with SIX Swiss Exchange and the New York Stock Exchange. Beginning 1Q18, the new entity will start filing form 10-Q and 10-K with the SEC and will start reporting the financials in USD by following IFRS reporting standards. Citi and UBS AG are serving as Clariant’s financial advisors with Homburger and Cleary Gottlieb Steen & Hamilton serving as its legal advisors for this transaction. BofA Merrill Lynch and Moelis & Company LLC are serving as Huntsman’s financial advisors with Kirkland & Ellis, Bär & Karrer and Vinson & Elkins acting as its legal advisors. On April 26, 2017, Huntsman had announced that the company is proceeding with an IPO of Venator Materials as against the previously announced tax-free spin-off. The company has confirmed that IPO of Venator is on track and is likely to be completed by July/August 2017 prior to the proposed merger between Huntsman and Clariant. As of now, we keep our previous valuation for Huntsman assuming the spin-off transaction which was based on the Form-10 dated 3/14. We will adjust our model to factor in the merger transaction and IPO of Venator and would assess the impact on target price and recommendation once there is additional certainty regarding the merger and IPO is available. Our previous valuation of VNTR, based on spin-off, implies a 82.2% value (or EV of $9.2 Billion for the HUN stub) and 17.2% (or EV of $2.0 Billion for the spin.) The SOTP is worth $11.2 Billion for Huntsman. The all-stock merger between Huntsman Corp. and Clariant AG marks another landmark deal in the Chemical industry that capitalizes on cost synergies by eliminating the overlapping businesses & products. The merger will create a leading global specialty giant with FY16 pro-forma sales of $13.2 billion and adjusted EBITDA of $2.3 billion (17.2%) with current enterprise value in excess of $20 billion, including debt, and market capitalization of $14 billion as on the announcement date. The merger is expected to significantly enhance the financial performance of the combined entity through a robust combination of technology, products and talent with a total shareholder value creation of ~$3.5 billion, driven by an annual $400 million run-rate (~3% of FY16 pro-forma sales) in cost synergies expected to be achieved within two years of the deal closure. These cost synergies are primarily Operations related ($250 million) and Procurement related ($150 million) with additional, one-time cost synergies of $500 million and incremental tax savings to the tune of $25 million per year. Furthermore, the combination of businesses will help HuntsmanClariant to leverage on the overlapping customer base of the two entities and seek new revenue sources by tapping potential growth opportunities from complementary products in automotive end markets. The merged entity will have a balanced geographic footprint with an increased strength in North America and China. The combined entity will be well positioned for capital investments with strong balance sheet (2016 net debt/EBITDA of 2.2x) and cash flow generation (2016 Operating Cash Flow of $1.9 billion) capability. In addition, HuntsmanClariant expects to maintain Clariant’s current attractive dividend policy, implying a +12% jump in dividend per share based on last year’s payout. Furthermore, according to the legal experts, if the company had proceeded with the spin-off, it would have been a taxable transaction as Venator spin-off and Clariant acquisition would have been seen as a ‘part of a plan’ under Section 355(e). Add to that, the IPO offers de-leveraging prospect for the parent unlike the spin-off. Huntsman Corp. (NYSE: HUN), based in the Woodlands, Texas, is a diversified manufacturer of differentiated organic and inorganic chemical products. The company operates in five segments: polyurethanes, performance products, advanced materials, pigments and additives, and textile effects. The products are used in a wide range of applications such as adhesives, aerospace, automotive, construction products, personal care and hygiene, durable and non-durable consumer products, electronics, medical, packaging, paints and coatings, power generation, refining, synthetic fiber, textile chemicals and dye industries. HUN manufactures products such as MDI, amines, surfactants, epoxy-based formulations, textile chemicals, and TiO2 and color pigments. On October 1, 2014, HUN completed a $1.28 billion acquisition of Rockwell Holdings Inc. which enlarged its pigments business portfolio with Performance Additives and Titanium Dioxide businesses of Rockwood. The company employs approximately 15,000 associates worldwide and recorded revenues of $9.6 billion in 2016. Venator Materials Corporation (NYSE: “VNTR”) is a leading global manufacturer and marketer of chemical products that improve the quality of life for downstream consumers and promote a sustainable future. The company’s products comprise a broad range of pigments and additives that bring color and vibrancy to buildings, protect and extend product life, and reduce energy consumption. The company markets products globally to a diversified group of industrial customers through two segments: Titanium Dioxide and Performance Additives. It is a leading global producer in many of the key product lines, including titanium dioxide, color pigments, functional additives, timber treatment and water treatment products. Venator operates 27 facilities, employ approximately 4,500 associates worldwide and sell products in more than 110 countries. For the twelve months ended December 31, 2016, Venator recorded pro-forma revenue and adjusted EBITDA of $2,139 million and $130 million respectively. Clariant AG (SIX: CLN) is a Switzerland-based producer of specialty chemicals. It operates through four business areas: Care Chemicals, Catalysis, Natural Resources, and Plastics and Coatings. The Care Chemicals business area produces ingredients for laundry detergents, fabric softeners, disinfectants and dishwashing detergents, as well as plasticizers, de-icing fluids for aircrafts and runways, and special solvents. The Catalysis business area offers a wide range of catalysts for the petrochemicals, plastics and refining industries. The Natural Resources business area provides products and services to the minerals and oil and mining industries. The Plastics and Coatings business area produces color and additive concentrates and performance solutions for plastics, flame retardants, polymer additives and waxes for functional effects in plastics, coatings, inks and other special applications, as well as organic pigments, pigment preparations and specialty dyes. For FY16, Clariant reported the total revenue of CHF 5,847 million and adjusted EBITDA of CHF 898 million or margin of 15.2%.